1. Color the light bulb in white. The lamp cap can not be painted. 2. While our bulb dries, let’s make a scarf for the snowman. Cut out the fabric striped and make a fringe on its edges. 3. Stick the scarf on the “neck” to our future snowman. 4. Now you need to draw a marker eye, mouth, arms and buttons. 5. 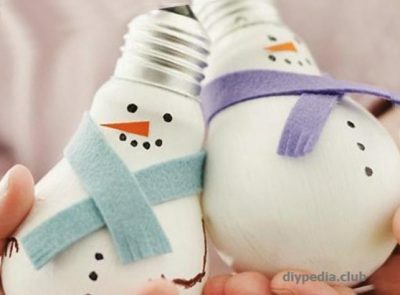 From the orange paper cut for a snowman spout and glue it. All! Our snowman from the lightbulb is ready.